Harold Camping. May 21st. October 21st. These are things we keep hearing about from the news, the pulpit, and the water cooler. I have personally received many Facebook messages, texts, and other questions as to when the rapture will be. One thing is clear. We can now safely rule out May 21, 2011. I have read and heard some within the Associated Press claim that most Christians reject the idea of the rapture; they have mocked it (referring to it as God “beaming us up”) and even pointed out that the word does not appear in the Bible. So before we can discuss when the rapture will be, first we have to see if it is even biblical. The word rapture does not appear in the Bible, but it would if our Bible were Latin. In 1 Thessalonians 4:17 Paul refers to a time where all Christians will be “caught up” together to meet the Lord in the air. That is a description of the event in which all living Christians will instantly be taken to heaven, and the words caught up are the English equivalent of rapimur in Latin. So the rapture (or The Catching Up, if you will) is certainly a biblical concept. But when will it be? Harold Camping, who is famous for his now debunked claim for May 21st, is not the first person to incorrectly predict the rapture date. In fact, another person was wrong on May 21st, 1994. 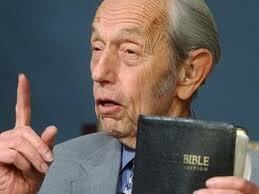 The person: Harold Camping. For the last 2,000 years people have been making claims about the exact date. Many believed the Y2K theories, that the rapture would happen at midnight as the year 2,000 rolled in. That theory was about as accurate as the predictions of worldwide power outages and computer crashes. There was a book put out in 1984 called, 1,984 Reasons Why Jesus Will Come Back in 1984. I have a book in my office called, 2008: God’s Final Witness. Both books give their reasons for the Lord’s return that year. I wasn’t able to get my money back when 2009 came around. How do people come up with these dates? They believe that God left us some encrypted codes in the Bible, and if we grab our Sherlock Holmes pipe and magnifying glass, we can put together all the clues. There are so many numbers in the Bible that I can make them say anything I want them to say. If I multiply the number of candlesticks in the Tabernacle by the number of lashes Paul received, I have my first clue. There are two problems with this: #1, that’s not how the Bible works. OK, that’s only one, but it’s enough for me. *Note: I know many want to use the verse that says that no one knows the day or the hour from Matthew 24:36, but that is in reference to the 2nd Coming, not the rapture. The context of I Thessalonians 4-5 is the rapture, not the 2nd Coming. Paul wrote that the rapture would be like a thief at night. If you knew a thief were coming, would you tuck yourself in for the night? Of course not! That is why Paul goes on to warn that we must be watchful. He compares the rapture to a pregnant woman; she might have an idea of when she is due, but she doesn’t know the exact minute she will go into labor. She must be ready—bags packed, gas tank full, route mapped out—because in a second’s notice she may make the trip. Like a pregnant woman we can have an idea that the day is drawing near. The signs of the times are hear. We have a great deception (ear-pleasing “preachers”), crazy weather (Joplin, Tuscaloosa, etc. ), and wars (War on Terror, Middle East turmoil, etc.). These are the signs that Jesus gave us to look out for (Matthew 24:3-8), but we must be ready for the exact minute. The Scriptures are clear: no one knows when that minute will be. If the rapture had been May 21st, would you have gone to heaven, or would you have been left behind? I’m glad the rapture wasn’t last Saturday, because that means that people still have time to get right. So when will the rapture be? I know with about as much certainty as I know when a thief is going to break into my house. So let’s not waste time with a calculator doing apocalypse algebra; rather, let’s be busy about spreading the Word and inviting people to get caught up with us. But I’m not going to get caught up in predicting a date.